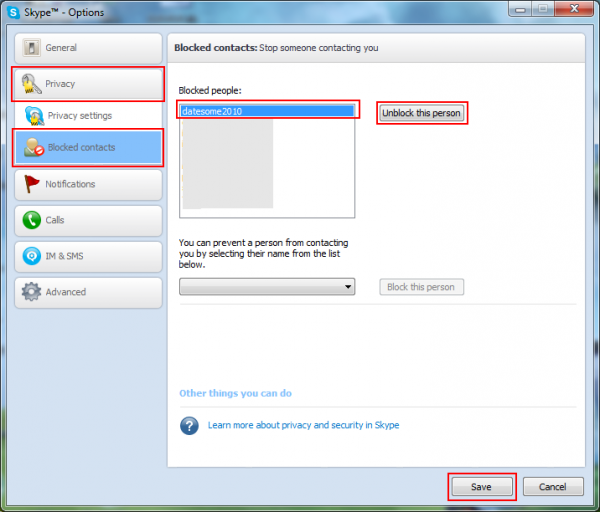 This article is for people searching for a way to block someone on Skype and in the same time to delete him from the contacts list and the blocked contacts list. First, let me say that this is not possible. Skype considers people to be blocked contacts only if they are in the blocked contacts list. If the user is not there then it is not blocked. But there is a trick we can use in order to accomplish something similar to blocking someone without blocking him. We will not receive calls or messages from the user but unfortunately we will be able to receive contact requests (as Jivanda mentioned in the comments). …to unblock the contact (if we have already blocked him) and to also delete him from our contacts list. Afterwards we will set our Skype settings in a way that does not allow people outside our contacts list to contact us and we are done. If you have blocked the user then unblock him. 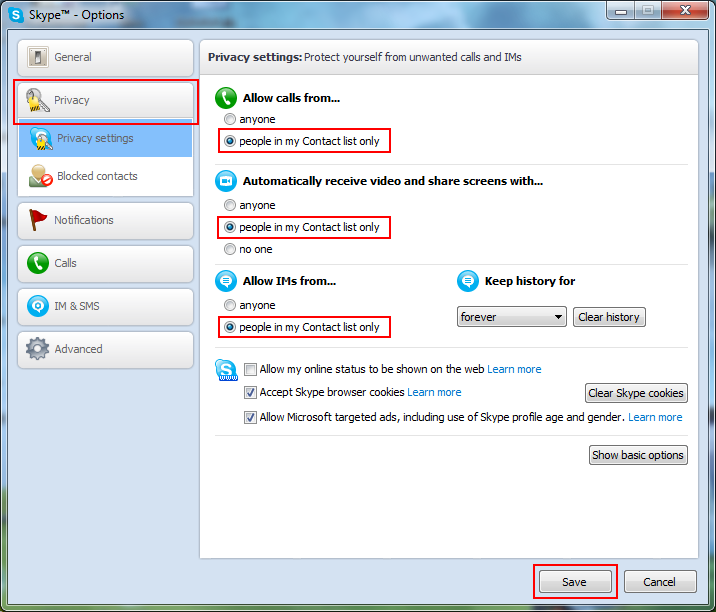 Sign in with Skype and from the menu go to Tools -> Options… -> Privacy -> Blocked contacts. Choose the user from the list and click the Unblock this person button. If you haven’t deleted this person from you contacts list – do it. Right click on him and click Remove from contacts. The user may still show in the tab with the recent conversations. This is not a problem and it does not mean that it is in your contacts list. But if you want you can also remove him from there by deleting your Skype chat history. And now all that’s left is to tell Skype to not allow people outside our contacts list to bother us. From the menu go to: Tools -> Options… -> Privacy. Set all options here to people in my Contact list only (as shown below) and save the changes. 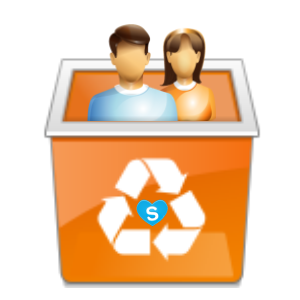 Step #3: deleting your Skype chat history will delete all chat history of all your contacts. Step #4: the removed contact can still IM you by resending a contact request again and put their message in the invite. Leaving the contact in the blocked contacts list prevents that. I wonder… Why would people want to remove blocked contacts from that list anyway? I love your site btw…! Very nice… keep going ! Thank you for the important feedback on this post. About the one contact history removal I am not very confident in this method because people have reported some problems with it. I will be searching for another method if possible. About the step 4 tip, I admit I didn’t thought about that. I am writing down to test this and think about it. I will edit the post later if I come up with something or in the worst case I will include a message that this that you say may happen. To be honest I am not sure why people want to remove users from the blocked list but I know they want. I have received several requests to answer this and it is also asked on the forums around the web. This is why I described this method I found somewhere on the forums (if I am not mistaken). Thanks for the useful comment and nice words! I tested this issue and you are right. Also I was not able to come up with any way of fixing it. This is why I mentioned it in the article so people know and make their own choice. One of my Skype contact had blocked me as the message I sent to that person was showing pending status. After few days due to some reasons I deleted that contact. But now when I see the history the pending message is showing a time stamp. Does that mean the message is been read by the contact? Hi. I don’t think so. I think that after some time it just stops showing as pending. The time should have been always there as well. My Skype shows the time on each message, even on undelivered ones. This is exactly what the article above is about. Please read it. Hi. A lot of things ca cause this. Are you using the latest version? Try reinstalling it or even completely uninstalling it with advanced mode in the program revo uninstaller (you will loose personal data) and then installing it again. You might have a firewall or antivirus blocking it. Or you may have network connection problems.